Thousands of people have heard of Chicago’s "White City" because of Erik Larson’s best-selling book, The Devil in the White City. 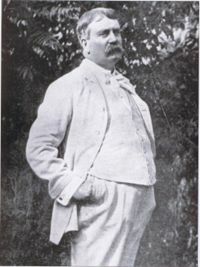 In this book Larson intertwines the story of two men: Daniel Burnham, the chief designer of the fair, and Herman Webster Mudgett, also known as Dr. H. H. Holmes. Holmes may have been the nation’s first serial killer. After constructing a three-story building on an entire city block (neighbors called it "the castle"), Holmes opened it as a hotel for out-of-town Exposition visitors. But some of Holmes’ guests never left the hotel, at least not alive. 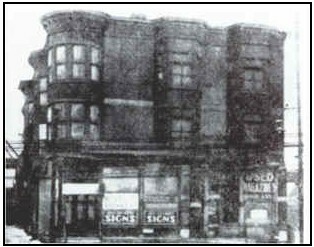 Holmes’ building featured soundproof rooms in which he tortured his victims. The rooms were fitted with gas lines so that he could asphyxiate them at any time. After they were killed, the bodies were sent via a secret chute to the basement, where they were meticulously dissected and then stripped of flesh. The skeletons were then sold to medical schools. In the alternative, the bodies were cremated in a giant furnace or destroyed in an acid pit. Holmes’ castle was clearly a Chicago chamber of horrors. Holmes may have killed as many as 230 people; however, there are only twenty-seven verified deaths. But over 27 million people visited the Exposition during the six months it was open. This means that the vast majority of Exposition visitors escaped the clutches of Holmes. 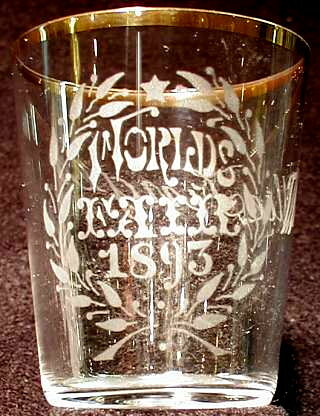 It is possible that many of them might have sipped their favorite drink from a World’s Fair shot glass while strolling the streets of the White City. 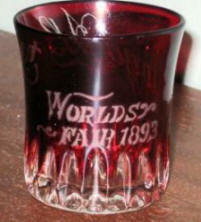 How many different Chicago World’s Fair of 1893 shot glasses are there? That is difficult to determine, because what someone might call a shot glass may actually be a souvenir toothpick holder or simply a small beverage glass. 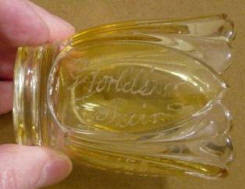 There does appear to be at least one definite shot glass, and this clear, gold-rimmed specimen with ornate etching is shown here. But there are countless "ruby flash glasses" that may or may not be shot glasses. Shown here are just a few examples. This first glass (at left below) is most interesting. 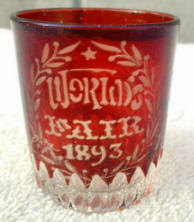 Note how the etching of this ruby flash glass specimen is virtually identical to the etching of the clear glass shown above. On the other hand, the two ruby flash glasses shown at middle and right above are very different from each other. 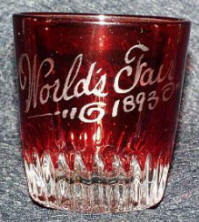 The Old Times whiskey took top honors at the Exposition, and several Old Times shot glasses advertise this fact. 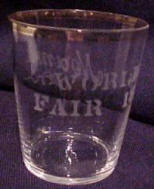 Consider, for example, the three Old Times glasses shown at right. 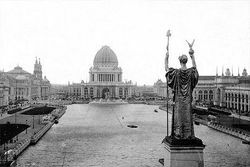 The World’s Columbian Exposition of 1893 was intended to inform all visitors of the momentous achievements Americans had made in such areas as the fine arts, industry, technology, and agriculture. It was a celebration of America’s coming of age--a grand rite of passage into the twentieth century. As a result, it gave America a chance to show itself off. For example, Gustave Eiffel’s inspiring Eiffel Tower made its debut at the 1889 Paris Exposition International. 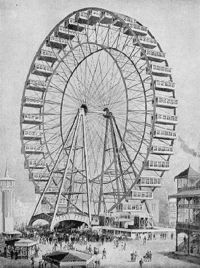 In response, George Ferris designed his Ferris Wheel for the 1893 Exposition. This technological marvel was 264 feet high and contained thirty-six cars. Each car could hold sixty people. Compare this Ferris wheel (shown at right) to today’s carnival versions, which have only about fifteen to twenty cars with two to three riders per car. The Exposition opened its doors to the public on May 1, 1893, and it shut them six months later on October 30, 1893. But during that brief period, the Exposition managed to produce literally tons of commemorative souvenirs. At least several hundred pounds of these items appear to be shot glasses. 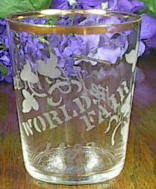 A sampling of these glasses would certainly dress up the shelves of any shot collector.